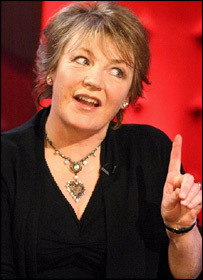 Culinary queen Delia Smith is hanging up her apron on television cooking "while the going is good". In a BBC interview on Friday Night with Jonathan Ross - to be broadcast on Christmas Eve - the Suffolk cookery writer says she feels it is time to go. Delia compliments the skills of the latest generation of TV chefs Jamie Oliver and Nigella Lawson but says: "It's too hard to do". She added: "I'm quite old now - I want to quit while the going is good." During the show she says she is very proud of "the Delia effect" created over her 32 years in television. "I managed to get into TV because it was time to move on from Fanny Craddock," she added. "Now people want to be entertained, whereas I was trying to teach how to cook, that's where it's different." During the interview Norwich City Football club director Delia confesses she does not like the mince pies she makes each Christmas, her favourite meal is Sunday lunch and she thinks her best dish is steak and kidney pudding.